Small building located in the ancient part of the village, is documented from 1224, but probably dates back to the tenth century, as they suggest the archaeological excavations that have accompanied the restoration (1940-63). The small church underwent repeated renovations and changes over the centuries; in 1897 it was again deeply tampered with: the bell tower was rebuilt against the facade, the walls of the nave were raised and the ceiling was rebuilt. 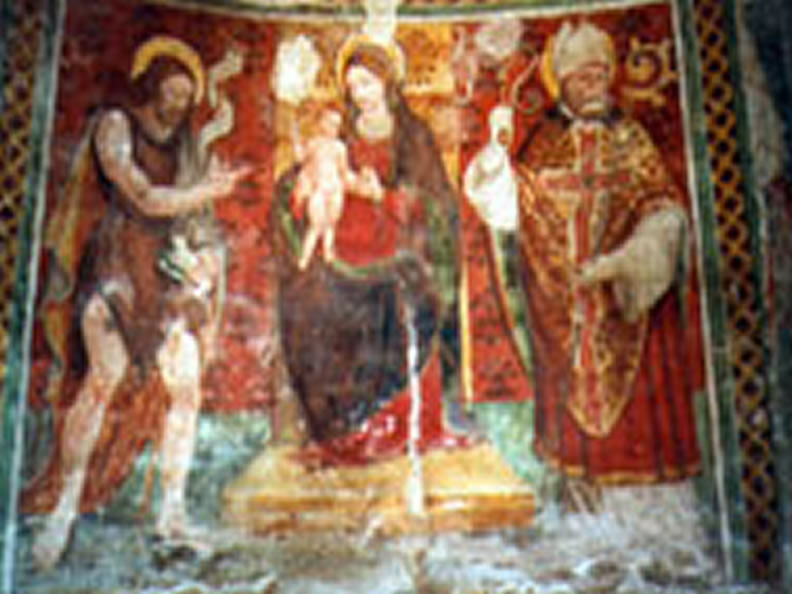 The restoration operations had the task of restoring, where possible, the original layout of the church of S. Ambrogio, whose particularity lies in the double apse and in the frescoes that it preserves inside, considered among the most significant in Ticino. In the southern apse, on the right, are represented the Beheading of St. John the Baptist, the Christ Pantocrator with the symbols of the Evangelists and an Annunciation (1338). In the northern apse (on the left) you can see the Coronation of the Virgin, divine justice as an angel weighing the works of man before a demon and the figures of St. Lawrence and St. Stephen, with richly decorated clothes. In the centre of the apse there is a remarkable Crucifixion. In the church there are also frescoes with scenes from the life of St. Ambrose, St. Anne and St. Joachim, allegories of faith and age of man, scenes of universal judgment, as well as a votive fresco of 1537 depicting the Madonna between St. John the Baptist and St. Ambrose. Key: Alvise Nenzi, Chironico (tel. 091 865 13 78).